Clay masks have been used for many centuries in antiaging beauty regimens and healing purposes with excellent results. Clays have the ability to detoxify the skin by drawing toxins in the body from the skins deep tissues with its natural absorbent qualities. It’s rich minerals and active enzymes invigorate and rejuvenates the skin while it exfoliates dead cells, removing debris from the pores. There are many types of cosmetic clays and each one has its own unique properties and come in a range of colours and textures. The best high quality sun dried clays in the market today come from Australia and Argiletz, France. Green Clay - Green clay is the most absorbing and commonly used therapeutic clay. This popular clay is formulated to restore health and help with tissue repair, drawing toxins out, normalizing excessive secretions of oil, and balancing cell activity. 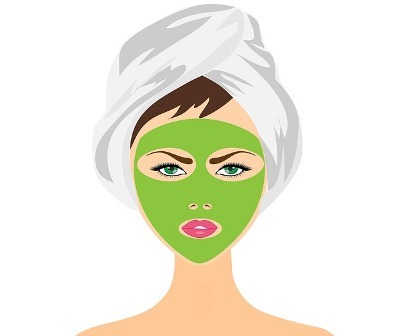 Green clay masks are used to cleanse, exfoliate, smoothe and soften, improve skin discoloration problems, clear clogged pores and increase the elasticity of the skin. Because it has enormous absorbent powers it is particularly useful to treat facial acne in teenage problem skin. It gives a youthful glow to the skin, while diminishing the appearance of enlarged pores. White clay is the mildest of all clays but has similar properties of green clay. It is especially suitable for sensitive, and delicate skin types. White Clay can also be used to create an excellent body deodorant. White clay is the most gentle and has many quantities of minerals in its composition so it offers excellent healing and regenerative qualities. Red clay is beneficial as a dry skin treatment and for sensitive and mature skin types. Red clay, which is high in iron oxide, is good for broken blood vessels, bags under eyes, and specifically for dull, tired complexions. This mild clay is intended to stimulate circulation and keep the epidermis refreshed and moisturized. Suitable for normal skin types this mineral-rich clay is used to revitalize, and restore neglected, tired skin. It has similar benefits and detoxifying properties as green clay.